Looking for show tickets in Las Vegas and don't want to pay full price? Try Tix 4 Tonight. They list available discount shows daily at 9:30 a.m., which includes some of the best shows in Las Vegas. Tix 4 Tonight also has discounted restaurants and buffets, as well as attractions. If you are looking to trim the cost of your Las Vegas vacation, find a cheap way to entertain yourself with Tix 4 Tonight. Tix4tonight have 10 locations, therefore, you should find one nearby if you are on The Strip or in Downtown. Save money on show tickets any evening, and future dates, as well. While they advertise tickets for 50 percent off, not all shows are that discounted. With that said, you can still save money. 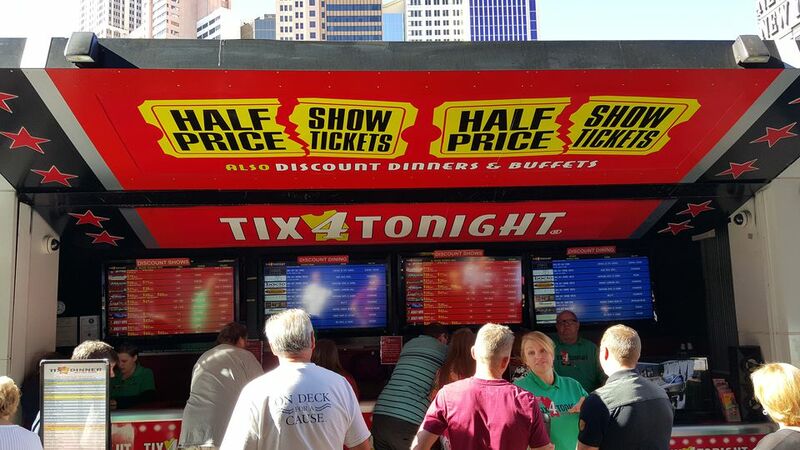 Find Cirque du Soliel shows, production shows, magic shows, and adult shows at the Tix 4 Tonight booths. You may have to wait in line, but it isn't too long, usually as the number of booth locations within proximity of each other make for a shorter wait times at each booth. The Tix 4 Tonight booths offer dinner coupons that save 15% to 30% on select restaurants on the Las Vegas strip. These coupons are available at the ticket booths, as well. Updates occur every morning and ticket sales go on throughout the day, you'll find some less popular shows will be highly discounted consistently, while more popular shows are best had on slow weekday dates. If you need a free show in Las Vegas, you can find a few on the strip. There are more than enough free attractions on the Las Vegas strip to fill your itinerary and keep your wallet full.